Seattle is filled with critters walking with their humans, gazing out of windows, and waiting to be adopted from shelters—not to mention the wild creatures that fly through the air, slither through gardens, and swim through the seas. In honor of The Stranger's Pet Issue, we've compiled all the best ways to spend time with animals and support their well-being through local organizations from now until August. Follow the links below to snag tickets to ever-popular events like Yoga with Cats, fundraisers like Seattle Humane's Tuxes and Tails Gala, boozy events like the Baby Goats & Brews, fun competitions like the Vashon Sheepdog Classic, general animal-appreciation opportunities like First Caturday, and everything in between. 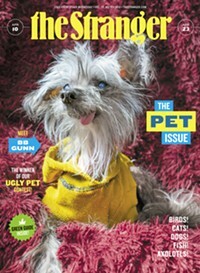 Check out our animals calendar for even more pet-centric events. Your dog can join you while you watch the Seattle Mariners play the Houston Astros (Sun April 14), the Texas Rangers (Tues May 28 & Mon July 22), and the Cincinnati Reds (Thurs Sept 12). Tickets also include a postgame walk around the bases and giveaways. Given the frequency with which the average cat curls up in a sunbeam and closes its eyes for hours on end, it's not surprising that kitties make excellent meditation models. Follow the lead of felines everywhere by joining Katie Meyer for an hour-long zen session, then spend another 30 minutes hanging out with friendly kitty cats. Raise money for the Puget Sound Goat Rescue by doing some morning stretches and then hanging out with two sweet hoofed creatures named Milky Way and Galactic. Meet some of Seattle Aquarium's divers and learn about ocean exploration while you wander through rows of fish exhibits—all while sipping an alcoholic beverage. Kitty cats of all shapes, sizes, and breeds will be evaluated based on their overall condition, appearance, and personality. At this social event for mixed breeds, your unique pup can prance around and make friends in a 7,000-foot outdoor play yard. Support the shelter pups at Bulldog Haven NW by enjoying BBQ fare like hot dogs, chips, and sweets. If you're looking to take home your own doggo, there will be plenty of adoptable bulldogs present. Let your doggo roam free in an off-leash area while you sip some beer and hang out with other pups from Pasado's Safe Haven. Mud Bay and Tail Wag Treats will be onsite with treats. You can join your pup in a 3K before letting them hang out in a doggie village, take obedience courses, and enter a juried pet show. A King County Police dog and his handler will also give a demonstration. Local bands Sandi Fernandez & the Beacon Hillbillies, Professor Sweater, Crashing in Karma, Brianna Skye & the Dark Clouds, and Fond Farewell will play live for the benefit of California feline rescue shelter Kitty Catfe. Grab a themed craft cocktail and celebrate National Adopt a Shelter Pet Day by meeting adoptable pups from Motley Zoo Animal Rescue. Bring your three- or four-legged friend along for an afternoon of Tito's cocktails (for you) and puppy treats (for them) to benefit Seattle Humane. Because even the laziest housecat is wild at heart, this monthly event is the perfect opportunity to treat your beloved feline to an outdoor adventure among other (leash-trained) kitties, whether they want to chase birds, eat bugs, or take a nap in the grass. Meet venomous snakes, amphibians, and other cute scaly and/or slimy creatures at "the only captive-bred reptile show in America." You can even look into adopting a new pet. Support the vulnerable animals of Seattle Humane at the shelter's biggest fundraising gala of the year. Flock to Bellevue on World Migratory Bird Day to browse for winged creatures on a ranger-led hike. Plus, make bird-themed crafts! Did you know that seasons change under the sea? Grab a drink and hear all about how spring affects the microscopic inhabitants of the Puget Sound at this after-hours affair. Your pet deserves to be immortalized in a portrait painted lovingly by you, its faithful human guardian. Make one here to support the dogs and cats of the Heartland Animal Shelter. Whether you want to do something fun with your pet or you're thinking about adoption, this event has plenty in store for animal lovers. Start out with a Dog Trot 3K and 5K Fun Run with your furry family member, then go ride a pony, cheer on pig races, and meet pets looking for homes. Did you know that the American Cancer Society helps both people and pets? At this fundraiser, you'll get to do some shopping, witness a dog agility contest, enter a costume contest, play games, and participate in a 5K run or walk to support survivors and those undergoing cancer treatment. Unless you're going to Chicago, where these cats live, it's probably safe to say that this will be your only opportunity to see circus-trained felines perform—"jump through hoops, roll on balls, ride skateboards, and more"—this summer. The only thing better than taking the ferry to Vashon is the promise of seeing athletic sheepdogs chase livestock around a field. In addition to the competition, this annual herding extravaganza—now in its 10th year—brings local fare, a fiber arts village, bagpipe performances, shearing demos, and more to the charming island. You and your dog can help raise money for the Seattle Animal Shelter Foundation's Help the Animals fund at their annual Furry 5K fundraiser. Greyhounds can take a personal day and let two unconventional racing breeds—bulldogs and beagles—take over the show. Bask in your love of one of the cutest dog breeds in the world (deal with it), pugs, by sharing your adopted pug's story, entering raffles, shopping for pug-themed wares, and more at this fundraiser for Seattle Pug Rescue. Play trivia, drink beer, and eat sweets for the well-being of the homeless kitties of Seattle Area Feline Rescue. This "all animal inclusive" event honors birds, cats, dogs, reptiles, and all other non-human creatures found in the Northwest. Round up your pets for Poulsbo Animal Clinic and Kitsap Humane Society's annual fundraising walk in downtown Poulsbo. Learn about the Puget Sound's favorite whale, orcas, at this spotlight event. You'll even get to see a 20-foot-long inflatable orca modeled after Granny, the matriarch of the endangered southern resident population, and the oldest known orca. Four local animal rescue and advocacy groups—including Furry Faces Foundation and Community Cat Coalition—will host this benefit with silent auctions, games (like keg rolling), and plenty of brews. Drink beer to help raise money for Pawsitive Alliance, whose goal is to "end the euthanasia of adoptable dogs and cats in Washington." There will also be raffles and a food truck. Are you a queer adult who loves marine life and cocktails? Head to the Seattle Aquarium after hours for some educational fun. Teeny-speedy Wiener dogs will race each other to the finish line in four preliminary heats culminating in a top-two advance round. They deserve your encouragement! For the fourth year in a row, you can bask in the company of newly born ruminant creatures, drink Northwest beer, and support the Puget Sound Goat Rescue at the same time. Give these baby goats all of your attention, because you'll be allotted a mere five minutes of cuddle time. Learn to protect the ocean's misunderstood sharp teeth-havers through special talks and activities. You and your pup could win prizes for categories like "Most Colorful," "Most Creative," and "Best Dog and Owner Combo" at this adorable procession. Everyone loves puppies, but let's not forget about our sweet old hounds. Old Dog Haven's Walk for Old Dogs supports the dogs in the shelter's permanent foster homes. With the exception of sunbathing, everything you can do in the daytime is more fun at night. At these after-hours events, you'll get to explore the zoo's exhibits and hear keeper talks while you sip watermelon sangria and snack on s'mores. Taste wine and enter raffles in the good company of your dog. Your proceeds will benefit Pawsitive Alliance. Picture this: a single stubby-legged, perma-smiling corgi running around a race track with carefree abandon. Multiply that vision by 70 and you've got the third annual Corgi Races, wherein lovable pups compete in six qualifying heats and a final championship. You can also meet adoptable dogs from the Auburn Valley Humane Society in the picnic area. The almost indecently charming Seattle Meowtropolitan lets you caffeinate while stroking, throwing toys for, or serving as a chair for a host of shelter kitties, many of whom are adoptable. Once in awhile, they up the ante by hosting Yoga with Cats, so you can contort your body into shapes that cats find interesting to climb on. To us, this sounds slightly discouraging—even the limberest yogin can't match the whiplike flexibility of a cat spine. But needless to say, you should pounce on these tickets, because they will probably sell out soon after they're put up.